Adco Covers are breathable on all sides and 100% fully waterproof on top and come with included straps and buckles for easy fitment. Having breathable material means that your cover will ventilate and as a result allow any moisture to evaporate. This will prevent any mould or mildew buildup whilst your caravan is being stored and is the number one reason you should use a caravan cover instead of a tarp. Choosing the right caravan cover is an easy process with the ADCO range - The height and width are standardised on the ADCO caravan cover range and it is just the external length that varies making choosing the right cover fairly simple. IMPORTANT - MEASURE YOUR EXTERIOR BODY LENGTH AT ITS LONGEST POINTS AS IT MAY BE A DIFFERENT MEASUREMENT TO THE INTERNAL FLOOR PLAN LENGTH QUOTED BY SOME MANUFACTURERS. We have 6 different sized Full Height ADCO Caravan Covers available that all have a standard height of up to 2400mm and a standard width of up to 2650mm in the full height caravan cover range: Simply just choose the cover that matches external length of your caravan body only. The covers physical length is the longer measurement and can be adjusted shorter up to 600mm (or 2 foot) by tightening the adjustment straps after installing. The Dupont Tyvek material that covers are made from have enough elasticity to cater for up to 300mm in height for roof top accessories and approx 150mm in width to cater for awnings mounted to the side of the caravan. The ADCO range of caravan covers are a generic fit in height and width and will suit most caravan shapes with plenty of adjustment for that snug fit. Tightening the adjustable straps will reduce the covers overall length by 600mm (or 2 feet) as well as cater for the sometimes unique shape of your caravan. Length: 6 sizes to choose from and Adjustable in 600mm (or 2 foot) increments. If you find that your external length measurement is exactly between 2 sizes - pick the smaller size as there is a little variance due to the materials elasticity and you will acheive a better fit. ALLOWANCES: The ADCO covers have enough elasticity to adequately stretch and cover Air Conditioners, Solar panels, Antennas, roof hatches and vents up to approximately 300mm high on the roof and approx 150mm wider on the side wall to cater for things like awnings. 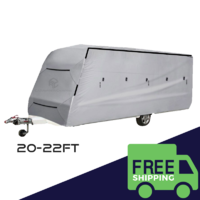 For the best fitting cover for your caravan, it is recommended that you cover the body only as this will better fill out the caravan covers volume allowing the cover to be tightly fitted against broad flat surfaces. ADCO does not recommend thaty you cover gas bottles, bike racks, rear bumpers and spare tyres as this can introduce a wear point and uneccessary flapping which could void your warranty and/or cause premature wear. We find the easiest way to install a cover is with the use of a step ladder that will allow you to reach the top of your van. We have found that broom handles and tent poles are not effective - especially in windy conditions. 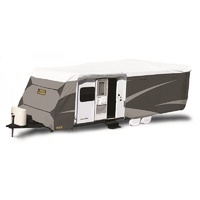 Simply start from the top of your caravan, roll out your cover along the roof and fold down the sides. Zip your side walls together and adjust the straps and buckles for a snug fit. The easiest way to explain this further is to start in reverse - imagine your cover fully fitted, the first step is to unclip all your straps and buckles, unzip your side panel walls and roll up onto the roof of your caravan. The second step is to use a step ladder and roll up the whole cover from front to back (like a big sausage). The third step is to fold the cover in half, remove from your roof and store.